FYI, my reply to timg56, currently #24, is marked “EDIT: OT, MOVED” but in fact has not been moved to the “Unforced Variations” thread. Not complaining, just thought I’d mention it. Ultimately, I believe that nukes will be part of the mix we are forced to use to avoid catastrophic warming. My objection to it is that it gets us no closer to where we eventually need to be–that is, a sustainable energy economy. It replaces one set of energy stakeholders (oil companies and coal barons) with another (Uranium miners and nuke operators). As to the rest of your diatribe, I object to your painting all developing countries as a monolith of corruption. They are not. Some countries, such as Ghana and perhaps Botswana, are making great strides and seem poised for takeoff. Zambia has improved. Latin America still suffers from corruption, but has made progress in this area. Finally, you concentrate on the expense while missing the opportunity. The country that first solves the problem of energy sustainability will make lots of money exporting that solution to the rest of the world. timg56…old reheated food…don’t you have anything better? OOooohhh we will need to spend gazillions of Jamaican dollars…EEehhhmm if the proper price is put on carbon, we have been getting a gazillion dollars loan from the future generations since the beginning of the industrial revolution. Time will come for the repayment…Any costs to upgrade our energy sources will pale in contrast…. and there was also this graph that is important http://egpreston.com/NatGeoOct2011b.jpg . 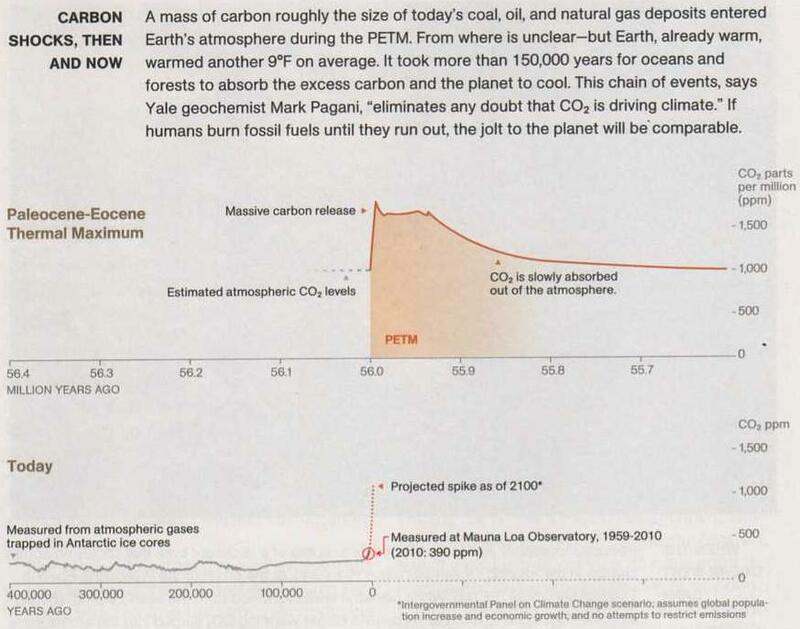 The article about PETM climate in the National Geographic should give a climate sensitivity and does give a prediction of a bad future. Is National Geographic right? The geography and inhabitants of Britain, already described by many writers, I will speak of, not that my research and ability may be compared with theirs, but because the country was then for the first time thoroughly subdued. And so matters, which as being still not accurately known my predecessors embellished with their eloquence, shall now be related on the evidence of facts…. Their sky is obscured by continual rain and cloud. Severity of cold is unknown. The days exceed in length those of our part of the world; the nights are bright, and in the extreme north so short that between sunlight and dawn you can perceive but a slight distinction. It is said that, if there are no clouds in the way, the splendour of the sun can be seen throughout the night, and that he does not rise and set, but only crosses the heavens. The truth is, that the low shadow thrown from the flat extremities of the earth’s surface does not raise the darkness to any height, and the night thus fails to reach the sky and stars. With the exception of the olive and vine, and plants which usually grow in warmer climates, the soil will yield, and even abundantly, all ordinary produce. It ripens indeed slowly, but is of rapid growth, the cause in each case being the same, namely, the excessive moisture of the soil and of the atmosphere. Though the following century saw Roman colonists drive viticulture to its northern limit in Germany, around Trier , and begin the production of exportable Bordeaux near Chateau Ausonne, nary a Roman olive ever took root in cool Britain . What, if anything, will be done about the Kyoto accord at the Durban conference. If NOTHING is done, what impact, if any, will this have? J. Bowers, #150–Thanks for a much cleaner translation of the Tacitus, and for some very interesting elaborations on climate in the UK! I posted this over at the AGU thread, but in case you missed it, I am re-posting it here for your sake. Hunt @ 156, to evaluate Durban you need at least your Daily Romm including this and many subsequent posts there. Also Democracy Now! Pete Dunkelberg @ 141, thanks for your reply to my post on the paper by Li et al. It is no doubt perfectly obvious that I am not a scientist. I realise there is a lot of research into cloud microphysics and aerosol properties and that there is a lot to learn. More aerosol particles and water transported into the upper troposphere and even the lower stratosphere!? If aerosols can do this and greater concentrations are produced by us from our Urban Dust Islands and our cultivated soils and pollen aerosols from our (hybridised) crops etc. etc. shouldn’t we be a little bit concerned? We cannot change back to a natural aerosol supply and we are constantly adding more. I mean – potentially alter larger scale circulations and effect global climate, seems pretty major to my unscientific mindset. That is what prompted me to ask others their opinion. Maybe, like you say, my mind is over interpreting what I am reading because to me adding our supply of aerosols is contributing to climate change, and the more I find out about them just seems to confirm this. Black carbon aerosols absorbing heat, fine smoke aerosols extending cloud lifetime but reducing rainfall, and BVOC aerosols readily attracting water and making it rain. This papers findings and the numerous effects of aerosols must all be taken into account in our real climate. I just think they are the poor relation to carbon dioxide and more people should be aware of the potential effect of aerosols. Maybe you are already but a lot of people are not. Thank you for the link to AGW Observer, Wow! Puts it in perspective, wish I could understand half of it, though! You said;- Li et al. is a good illustration of the need to find out in detail the consequences of our actions. These details may influence the sort of modest policy changes that may actually be made while we hide from the larger picture. My assertion is , Anthropogenic Aerosols are part of the larger picture and are here to stay so modest policy changes cannot be implemented easily. What could we do? They might be running the show! Today in Africa we are suffering, in part because of climate change. In Europe you’re not suffering. But if you don’t do much in Durban your children will suffer and they are not used to suffering. Edward G., the guy you quote wrote that the National Geographic article ‘suggests’ a 280-foot sea level rise within a 200 year period sooner rather than later. He’s hallucinating. It doesn’t suggest what he’s implying, he’s scared, or mongering, or both. Don’t let the nitwits distract from what we really do know, which is plenty scary. Yes, it’s a serious concern, yes fast changes are likely. Yes, we’re pushing the climate system _faster_ than events at the PETM did. Will another jump from 1000 to 1500 be kicked off by ours? time will tell). Have we explained the Fermi Paradox yet? Keep listening for signs of intelligent life from the universe. Pielke Sr. rescued by Tisdale? What next? ‘Asserting’ that you mis-quoted Galileo? I provided a link that demonstrated it. 1. Science is done by formulating testable hypothesis’ based on physical processes, testing those hypothesis’, revising and repeating as necessary, writing up a draft paper and submitting the draft to a reputable journal in the field for consideration for peer-review and (maybe) subsequent publication and yet more subsequent “review” in the form of either citations by other papers or comments (or even subsequent papers) overturning the draft piece in question (in a nutshell). 2. Science is NOT done by climastrological curve-fitting of graphs that are then put onto various blogs in guerrilla-publishing-fashion to sway those not versed in the scientific method. Suggestion (in the spirit of being more ‘precise’): Write up your hypothesis’ (replete with references to physical mechanisms that can support your assertions) in the form of a paper and submit it to a reputable journal for review. The responses in this thread to you & your work (linked @128) presents an interesting collection. May I make a few observations. Sadly, such a situation does make speculations more difficult – knowing the science becomes a prerequisite for doing science. But such is the way of things. Given the need to know the science, conclusions that jump far from the accepted wisdom require a lot more attention to the science and what they are diverging from. In your paper North Atlantic Oscillations Part One, references to the AMO/NOA comprise just two quotes, and the controversial one is from a paper with the ink hardily dry. Is this adequate? I would suggest you invest some resources to searching the literature on this specific area if you wish to develop a serious thesis on the AMO/NOA. Indeed, your thesis that ‘one end’ of the NAO precedes AMO by 11 years may be worthy of attention although I note the Response @138.. (So I am sort of fine up to your Fig 13.) But then to propose that a good correlation between the data can be obtained after it has been manipulated in some particular manner – that rings very loud alarm bells for me and they continue to ring as you present “ambiguity” rather than proposing some physical basis for you manipulations. As presented, this is a step too far. Worryingly you intimate at various points in this thread that you have already made yet further steps. So my advice ‘one step at a time’ may be seen as unhelpful. Together, Monckton and Watts drive into yet another deep pothole. Thanks for using your time to read the article, I hope it was not entirely wasted. –	I search through data for valuable information that others may have ignored. There is nothing hidden in the way are treated data, it is clearly described. The authors of the NA SST data compilation put large question mark on the accuracy prior 1950, so my analysis is actually doing opposite of what you are implying, i.e. it is increasing credibility of the AMO data set, since there are no such doubts about the RPA data. and for four centuries, many from Galileo to Dr. Hathaway of NASA tried to find that elusive mechanism you talk about. Some of the American PV panel factories are partially powered by PV cells. We’ll have the Solar Age when aluminum pack frames for hikers and campers are made in factories powered by PV panels. Responding to your two points. You tell me “I search through data for valuable information that others may have ignored.” You thus hopefully know when you see ‘valuable’ but ‘ignored’ data. However, can you determine why ‘valuable’ data has been ignored without a grasp of the on-going science? In this thread, Galileo actually appeared first @133. Your example (not mine) of 400 years of collecting & analysing sunspot data – no harm in that but how useful was it all? Nailing what sunspots are and how their number will change in future, other than the 11 year cycle, was/is little to do with sunspot counts. As for stopping, with intriguing data it is likely nothing will stop us humans with our pattern-seeking obsession. 152, Ray Ladbury: Finally, you concentrate on the expense while missing the opportunity. The country that first solves the problem of energy sustainability will make lots of money exporting that solution to the rest of the world. Intriguingly, the U.S. has a balance of payments surplus in international trade in solar power technology. Sorry I do not have a link to the report in which I read that. Given the large fraction of the high elevations of the ice sheet that experienced more melting than average, the blue fringe of “less melting” along the southern and western coasts might seem puzzling. 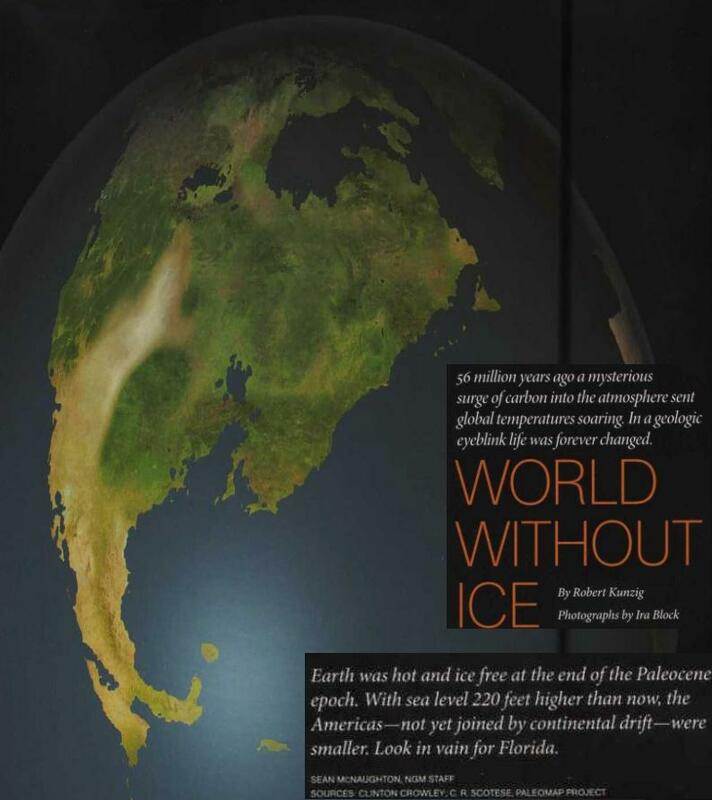 How could the lower elevations of the ice sheet be melting less than average if the higher elevations are melting more than average? According to remote sensing scientist and Arctic Report Card author Marco Tedesco, this ribbon corresponds to places where the snow now retreats so completely in the summer that the ice surface is bare. The bare surface “blinds” the satellite to the presence of melt water; it is much easier for the satellite to detect liquid water when the surrounding terrain is snow-covered. Because recent years are more likely to have bare ice than the earliest years in the time series, the analysis seems to show that melting has decreased at the ice margin. Scientists know from field observations, however, that this outermost edge is melting, too. Most of your post concerns economic predictions. If you are that good at predicting the economic future, I would suggest that you invest in the stock market, make a lot of money, invest in a politician or two, and attempt to have your way with the economic policies of this country. What your statements do is to deny the real costs of doing nothing in the face of the strong scientific consensus that anthrpogenic global warming is real, is happening now, and that if we don’t lower the human release of CO2 into the atmosphere very soon, human civilization will suffer far more than your worst financial predictions as to what would happen if we cut back on our use of fossil fuels. The paper you posted includes virtually no data from ocean areas, which encompass over two-thirds of the planet. It also includes very few data points from the poles, which is where most of the observed warming is occurring. This is not very convincing. Can you imagine that, Dan, months! Remarkable! That’s not really anywhere close to the consensus about much of anything, Dan. So you are just going to ignore the statements I posted from the IPCC AR4? This is scientific data that clearly supports my contentions. There won’t be much of a discussion if you ignore half of what I have posted. Your link states: “Our estimate for the bias due to UHI in the land record is on the order of 0.03C per decade for urban stations.” Since most of the world is not urban, this really says little to disagree with the IPCC AR4 number for the UHI effect that I posted, which is 0.002ºC per decade for the entire planet. Thank you for your words of wisdom, I shall move on. For the charts you post, you didn’t keep the data file, and you don’t remember where you found the data — so all you have to show is the pictures? If you had the data, or a reference for where you got the data, you could publish a reference along with each chart — like a scientist would. It would be a good start, if you were to start with the data. Well worth perusing — both historical data and projections of changes. What you wrote is nonsense bordering on falsehood! I have made no such remarks. Data sources are forwarded by emails to Dr. Svalgaard (solar scientist) of the Stanford University and Dr. Eric Steig (climate scientist) of the Washington University. Once my article appears on-line it will quote all relevant sources and more! How do you plan to footnote the charts — you mean that eventually, people _will_ see references along with the charts? Number of graphs in the above article have appeared here and elsewhere prior to the publication. Data is not secret. Some months ago I tried to post it on your blog, with the source quoted, you censored it; since it has been posted on number of other climate blogs. If you whish to know do your own homework. One would think that your ignorance of one the world’s best known temperature data series can not be acceptable excuse for primitive language & mannerism? Don’t forget that this blog is read worldwide. Trying to graph 50 years of snow cover anomalies as linked to is asking a bit much. A better presentation of snow cover anomaly graphs (4 months – 10 years) linked here. What you miss looking back only 10 years is the period of strong decline prior to 1990. Also this format doesn’t illustrate the continuing summer decline too well. My attempt at doing both is (a two click) linked here. Yesterday I read Gilbrt Plass’s 1956 article. His argument seems to be this: the interglacial oscillation is caused by the slow circulation of ocean waters. The ocean is the only real sink for carbon dioxide, but because the circulation is so slow, as balance of ocean surface concentration and atmospheric concentration is reached early, and atmospheric concentration begins to rise when the ocean will absorb no more CO2. As atmospheric concentration rises the ocean will absorb a little more, but not for a long time will it ever absorb enough to get lower than what it was at the previous balance point. Now what happens when the atmospheric concentration is high enough to cause a rise in temperature sufficient to start the release of sequestered CO2 in clathrates and permafrost. Since the ocean cannot at least for a long time reduce CO2 levels enough to lower atmospheric concentrations, this high average temperature will remain for a long time continuing to cause the release of more CO2. I presume the runoff from melting glaciers will produce a new sea surface that can absorb more CO2, but that will be only in a small area. Could it be enough to stop this feedback cycle? If not why have we not reached the “tipping point” already? You really need to read your references more closely. The AR4 report clearly states, “this assessment adds the same level of urban warming uncertainty as in the TAR: 0.006°C per decade since 1900 for land”. This is a factor of 5 smaller than the recent report. This is also referencing work that is over a decade old. Zeke mentioned the BEST work over on the AGU thread, which showed 0.02C / decade. You should also refrain from attacking the researcher, and stick to the published work. Yes, sometimes scientific works does take months to collect and analyze, sometimes longer. Even with the aid of supercomputers, science cannot progress at the speed of light. It takes time, sometimes painstaking long time. Finally, it is extremely difficult to obtain tree-ring and stalagmite data from the polar regions. Vukcevic copypasted part of what I wrote, leaving off my question mark. I’m done with the guy — at least ’til data files are identified for the graphs. Once they are, anyone can check the claims made about correlations. Michael, IIRC, Plass published a couple of things in ’56. Would you mind being more specific, just so those interested can follow your comments better? MA Vukcevic. This is all getting rather too silly for my liking. MA Vulcevic. That is far too much faffing about. It is no surprise people lose patience with you. Do you not see? You have published your graph! The whole wide world can log on and see it. Forget your ‘article’ protocols. The graph is in the public domain. So it has been published. So who are these authors of the NA SST data”? Provide just one link to where the data “has been posted on a number of blogs” or some other useful reference. It is an easy step but we rely on you to make it!! I assumed people who comment here know that much. The second link you posted stated: ““Our estimate for the bias due to UHI in the land record is on the order of 0.03C per decade FOR URBAN STATIONS.” The emphasis is mine. The AR4 estimate is for land, which includes ALL land – rural areas as well as the Antarctic, and takes into account satellite data. And ALL LAND is a mere one third of the planet. So who is the one who has misinterpreted the evidence? You are comparing apples to oranges. Your study DOES NOT indicate that UHI effects are driving the observed warming. I DID NOT “attack” Dr. Lüdecke personally. I pointed out that many of his scientific views on AGCC are outside of the consensus on many issues, including his insistence that there has been no warming since 2000, or that the “remarkable increase in solar activity” is causing the observed warming (except that there has been no warming since 2000, of course!). This is evidence of possible bias and faulty logic, or an inability or stubborn unwillingness to take into account the reams of other research that prove these ideas highly unlikely. In science, until research has been debated and discussed (and eventually referenced) by climatologists far more knowledgeable than you or I, the past credibility of the researcher is a legitimate issue to take into account. My sarcasm was directed at implying that “months” was a long timeframe for understanding the science of the earth’s climate. It is not. There are already good proxy data from many polar regions: ice cores. They are telling a far different story than the claims of Dr. Lüdecke. I see no excuse for denying the clear scientific consensus on AGCC without far better evidence than you have posted. This summer was brutally hot, and, thanks to our scientifically illiterate governor, our state is not responding fast enough to the growing problems that AGCC is likely causing in central Texas. I am not really inclined to grant the benefit of the doubt to scientists like Dr. Lüdecke, who are in a small minority. If you continue to deny the conclusions of every scientist with which you disagree, then by definition, you will agree with everyone. However, a small minority consensus does not really do us any good when it comes to the broader scientific perspective. I pity you with your governor, who appears to be illiterate in a lot more than science – lately it has been the number of supreme court justices. What, if anything, does the new UN climate talks agreement say about sea levell rise? where the HMF is the heliospheric magnetic field at the Earth’s orbit, (are you familiar with the subject?, if not read works of Ken McCracken, the NASA scientist). I hope that was helpful, but it could make discussion far easier if you indicate what expertise you have and in which field of science. Commenting on something you have not entirely understood is often unproductive. You could benefit from re-reading the posts on which you whish to comment. I shall not waste any more of your valuable time on this particular matter.